Farm School is on Tuesdays and Fridays from 9:30 AM to 12:30 PM. Come one or both days. Drop in or sign up for the whole month. The cost is $20 for the three hour class. You must RSVP to attend (send an email to laughingbuckfarm at gmail dot com). Tuesday Farm School classes are smaller and geared for older kids. It is drop off only for ages 3 and up. 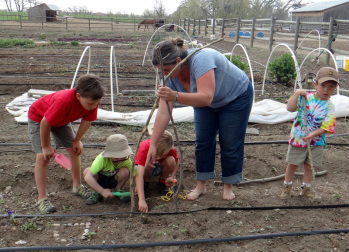 Friday Farm School classes are for the younger set, infants (with parent) up to age 7. Age 3 and up can attend on their own, parents are welcome to join their little ones. Homeschool Farm Class sessions are for older children with a focus on growing a deeper understanding of life on the farm. The first hour will be spent with younger morning Farm School younger farmers as we work with horse care and riding. Then lunch and our lesson of the day. Tuesdays, sign up for two week session 12 PM - 3 PM. 2 classes $40 per session ($20 per class). Are your kids interested in learning what is getting done out on the farm? We are creating farm sessions for the Month of April and May in which children will learn animal care and feed, horse care, grooming and riding as well helping us get the garden for this growing season. We will provide a snack of popcorn popped in coconut oil but please feel free to send one with your child. Sessions will be 4 classes offered on Monday and Wednesday ages 7+ and $65 per session ($16.25 per class).